Zone CCTV are a local Leeds based company. Our main aim is to increase security and reduce crime in West Yorkshire. We do this by offering our customers a diverse range of high quality and well tested security products. We feel that prevention is always better than cure and we certainly have the solutions to keep your property safe. We specialise in supplying and installing high definition CCTV to homes and businesses. From a one camera install to a 90 camera new build development, we have the experience to cater for any project. Our engineers have worked in the security industry for many years tackling the toughest of jobs and gaining valuable first hand knowledge seeing the damage criminals can cause. With this experience we can immediately point out any vulnerabilities with the property and bring it to the owners attention. CCTV picture quality has improved so much over the last 5 years. With the development of IP technology, cameras can be installed with high speed ethernet cable without the need for extra camera power supplies and BNC connectors. The CCTV cameras our engineers install produce the maximum HD 1080p resolution. The cameras can go up to 4mp which helps zooming into a picture which playing back the footage. This is due to the increased amount of pixels the cameras have the ability to record at. Zone CCTV will complete a full site survey before we recommend any kind of CCTV system. 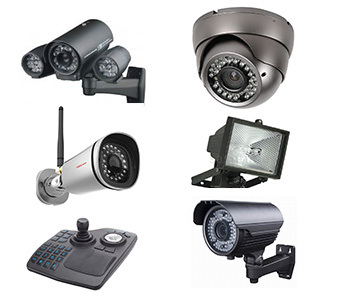 There are many different types of cameras we provide to ensure the property is fully covered. Long range infra-red – You may require a cameras with a long range infra red beam. We have cameras that even go to 150 meters. Short range infra red – Cameras that are positioned above the front door or on gate posts should only require a short range infra red i.e. 10 meters. If you have too much infra red at a short range, the picture looks a big white blob on the screen. Wide angle lenses – If you want to cover a wide large area, for example the whole of the back garden, we would install a wide angle 2.8m lens. Narrow lenses – Sometimes it is beneficial to install a narrow lens to reduce the infra red noise (bounce back) from a wall. These would be used for looking down a narrow path normally at the side of a property. How much memory to install? Most commercial venues request 1 weeks recording where as domestic properties we would recommend approximately 2 weeks. This means if you go away on holiday there is piece of mind that your property is fully covered. We also recommend recording at a very high resolution, therefore we install more than enough memory to achieve the very best playback quality possible. Once the system is installed, the engineers will connected it to any smartphone, tablet or PC to enable live viewing of the cameras from anywhere in the world. Although the cameras footage will be recorded continuously, the applications do provide many useful functions. Video – Record video from from the app and store it on your mobile phone. Pictures – Take snapshots of live footage from your phone. PTZ – If the cameras are on a motor, you can control the zoom and position from he mobile device. Speaker – If a speaker is connected to the CCTV system, you can talk through the mobile phone from and your message will be projected live through the tannoy. Zoom – Pinch the screen of the mobile device to zoom in and out of the footage. Playback – Play back footage right from the mobile device.